YOU WILL RECEIVE AN EMAIL AND INSTANT NOTIFICATION ASKING YOU TO PRINT YOUR TICKET(S). PLEASE DISREGARD THIS NOTICE. IT IS NOT VALID FOR RAFFLES. ONCE YOUR TICKETS ARE PURCHASED YOUR ORDER IS COMPLETE AND YOU WILL NOT BE MAILED OR NEED TO PRINT TICKETS. THE WINNER WILL BE CONTACTED VIA EMAIL ON DECEMBER, 4, 2016 (DAY OF DRAWING) AND NEED NOT BE PRESENT TO WIN. The Nantucket Preservation Trust is honored to be the first Island beneficiary of the Cape Associates, Inc. playhouse donation program. The Cape Cod Company is a lead custom home building company located in Eastham, Mass., and began the annual playhouse donation program in 2001. To date the program has donated 27 playhouses, raising over $120,000 to benefit the chosen non-profit recipients. 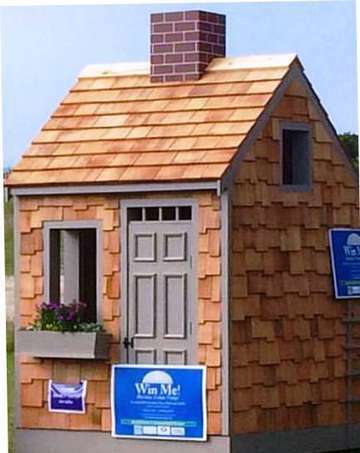 Purchase one or more of the 300 available raffle tickets for your chance to own a "miniature" Nantucket house. The playhouse will be on display now until December 4 at Bartlett's Farm, 33 Bartlett Farm Road. Tickets are available to purchase at the farm market, please look for the cashier with a raffle ticket sale sign. For the most up to date store hours visit: www.bartlettsfarm.com. Winner is responsible for all required permitting, if applicable. Delivery of playhouse must be arranged within one week of drawing. FREE delivery on Nantucket, site must be prepped and accessible. Arrangements for off-island delivery must be made and paid for by winner before 12/14/2016. Winner can personalize text for NPT house marker. Cape Associates, Inc. for their support in making this possible! Map of Nantucket Preservation Trust Raffle!